· The PM2000 is a new high specification, laser display controller. It has been designed for professional live shows, where it is important to get the effects that you need, when you need them. With PM2000 you can take laser display frames “as is” without any modification from many different popular laser display formats, and do what you want with them using modulations in real-time. The modulation engine is extremely advanced and supports many features, including the traditional ‘rotate’, ‘flip’, ‘zoom’ and ‘rove’. There are a large number of waveforms available to the modulation engine, which allows for some incredible effects to be achieved. 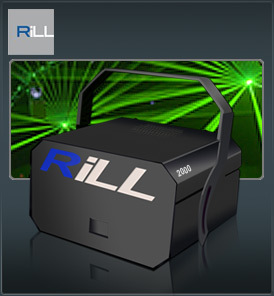 The PM2000 additionally has support for traditional laser display oscillator type effects. The oscillation engine is very advanced when compared to “stand alone” desks of the 80’s. Using the calculation power of the PC’s internal processor - An unlimited number of effects can easily be obtained using the oscillators. If you combine the oscillation engine with the modulation engine, you’ll be absolutely amazed at what you can achieve! The PM2000 laser controller is capable of storing a total of 6500-programmed effects. Each image/animation effect can have up to 65536 total frames, as long as there is enough memory within the PC, you can load as many image animations with up to 65536 frames as you want, provided that you do not exceed 6500 effects.